Last spring Bluegrass Bands and Helping Hands released a benefit CD to help raise public awareness for the Miracle Field project. The CD Bluegrass Bands Helping Hands Volume 3: "Big Leagues" is a fantastic collection of 16 donated tracks featuring traditional bluegrass, gospel bluegrass, and contemporary bluegrass and beyond. Performing artists include: Earl Brackin, Mark "Brink" Brinkman, Greg Brooks, Becky Buller, The Dixie Bee-Liners, Jim and Valerie Gabehart, The Hillbenders, Jubal's Kin, Jean-Luc Leroux, The Lone Mountain Band, Milkdrive, Rich In Tradition, Frank Solivan and Dirty Kitchen, Special Consensus, Valerie Smith and Beck Buller, and Donna Ulisse. In October, Mountain Heart, Missy Raines & The New Hip, The Farewell Drifters, MilkDrive, Steel String Session, Gary Stanley Jr., Rightpath Bluegrass Band and Spatial Effects performed at the Downtown Dalton BBQ and Music Festival to raise awareness of this worthy cause. "We can't thank all of our supporters enough" says Millie Hicks Miracle League board member. "We are so grateful for the generosity of everyone involved, but this is only the beginning--we will continue to raise funds for a handicapped accessible playground, and yearly sponsors for equipment, uniforms, etc. Thank you for all you have done!" 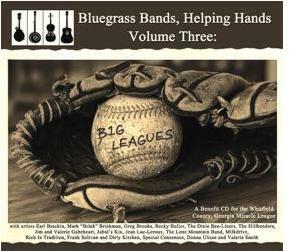 The Bluegrass Bands Helping Hands Volume 3 CD sells for $15 with 100% of the proceeds benefiting the Miracle Field. CD's are available until December 1st at the following North Georgia locations or on-line at www.bluegrassbandshelpinghands.com . Supporters may also make tax deductible donations directly to The Miracle League (see website for information) http://www.communityfoundationnwga.org/MiracleLeague.html .